The Indians are next in our Offseason In Review series. Austin Kearns, OF: one year, $1.3MM. Orlando Cabrera, 2B: one year, $1MM. 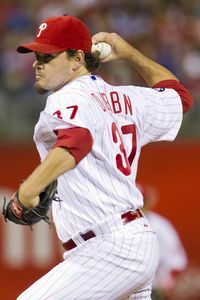 Chad Durbin, RP: one year, $800K. Chris Antonetti's first offseason as Indians GM marked the second year in a row the team spent about three million bucks on free agents. As opposed to the Pirates and Orioles, the Indians were not willing to spend money on free agent placeholders. The Indians flipped Kearns for Yankees prospect Zach McAllister last summer, and that might be the plan if any of the veteran signings are having decent years at the trade deadline and the team is struggling. Durbin (pictured) is a solid reliever, and getting him for $800K is good value. I liked the minor league deals for Johnson and Buck, as both have upside and opportunity if they can get healthy. Can the Indians become the surprise contender of 2011? The offense will ideally be elevated by full seasons from Grady Sizemore, Asdrubal Cabrera, and Carlos Santana. Position player reinforcements could arrive in the form of top prospects Lonnie Chisenhall, Jason Kipnis, Nick Weglarz, and Cord Phelps. But even if we optimistically grant the Indians an above-average offense, to contend they'd need breakout performances from pitchers such as Justin Masterson and Carlos Carrasco, a strong debut from Alex White, and improvements from several of the relievers behind Chris Perez. It's a lot to ask. The Tribe's farm system ranks seventh in baseball, according to Baseball America, which praised the club for having best 2010 draft of any team. They're stocked at both the lower and upper levels of the minors. This is a club that will get better in a hurry, even if 2011 is not the year. The Central should be pretty crazy in a few years, all 5 teams should have a legitimate chance of winning the division. I’d say 4 teams have a legit chance. I don’t see the Tigers ever being contenders again. The Tigers contend every year, just not for first in the division. Indians and rap, like spaghetti sauce and boogers. in the 2nd half, the Indians had the 4th best rotation and 2nd best bullpen in the AL. Even with Size, ACab and Santana out they finished only 4 games under .500 in the 2nd half. The Indians played better at the second half of last year than they got credit for. While I still think they’ll realistically come in fourth, it wouldn’t surprise me that much to see them make a run at third place, maybe even second. Expect this team to be a legitimate playoff contender in 2012 and on, barring injuries. Maybe if Hafner suddenly retires. He’s stuck in that lineup until his contract runs out.